The history of my interest starts when I left school and while I was doing my apprenticeship as an electrician, it was the start of intelligent lighting by remote switching and clever signals in the power cables that switched lights remotely. It was an awe-inspiring concept that the refrigeration engineers could log-in to the fridge packs from home on the lap top (via a 56k modem of course) and turn units on and off and change settings. This is something that I was very interested in and things have been developing lately! So with the developments in cheap parts and access to the internet being faster, things have become more accessible to the home user like the advent of the WeMo from Belkin, now available here in the UK. You are now able to control home appliances with this modular system via your mobile phone, email or social media with many more possibilities being available each week. This was so very easy to install. I had to plug in the unit, go to settings on the iPhone to find the plug, then give it a name and as you can see, an image. I can then control the plug from the iPhone. The software on the phone also has time of day rules so the drinks fridge is set up to come on half an hour before we open. You could have the slow cooker ready in the kitchen and turn it on when you are 4 hours from home. Maybe that toddler on the landing can turn on the light somewhere? You can also use IFTTT to control the lights by Twitter. When I tweet from my account #Flash it makes the lights flash. I have also installed a third party app that looks at my Geo-location and turns the Boiling Hot Water boiler on when I pull up outside. 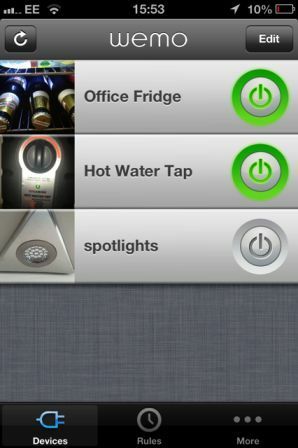 This has practical uses as well as being fun, as you can also get a WeMo detector that can pick up movement. In effect you could set it to text you, tweet, post something on Facebook or simply turn on a light when someone or something enters the room. My next project is an amber flashing light every time my e-commerce website gets an order as it comes in via Gmail, something that you can also connect to the WeMo via IFTTT. I purchased the 3 pack of plug controllers for use in the office for around £100 with delivery but you can also get single and twin packs here in the UK. Try it out and remember to connect it to IFTTT too!